As we enter the new year, there are several exciting developments in the Town of Redington Shores that I’d like to share with you. After months of negotiation, permitting and patient waiting, the under-grounding of utilities on the east side of Gulf Blvd has finally begun! The contractors have started the project in Redington Beach and will work their way north to our town over the coming months. Please expect some lane closures during the project so take extra care when driving through the area. Another important development that will benefit our residents is the planned construction of a new Pinellas County multi-use fire station just south of town hall. The new facility, located between 173rd Ave E and 174th Ave E, will be shared with the other Redingtons (Redington Beach and North Redington Beach) and should provide a significant improvement to emergency response times. In addition to EMS, the building will also house our town’s maintenance equipment. I couldn’t be more pleased with the partnership and collaboration between the Pinellas County and the other Redington mayors as we continue working to improve services to our beach community. On a lighter note, I am excited to announce that the three Redingtons will be kicking off our “Movies in the Park” events this spring. These outdoor movies will be free events that are open to all residents of the three towns. The first movie, “Jumanji”, will be shown in North Redington Beach at 6:30 PM on March 1st (rain date March 8th). Redington Beach will be next with the showing of “Despicable Me 2” at 6:30 PM on March 15th (rain date March 21st). The “Movies in the Park” spring series will conclude with the Town of Redington Shores showing Disney’s “Ralph Breaks the Internet” at Constitution Park at 7:30 PM on April 5th (rain date of April 12th). If you are free these evenings, please bring your chairs, blankets and coolers and join us for this family-friendly event. And finally, please note that the Town of Redington Shores commission meetings are held at 6:00 PM on the second Wednesday of each month and the commission workshops are at 6:00PM on the last Wednesday of each month. If you would like to learn more about our current town projects and other upcoming events please drop by for one of our upcoming town meetings. Let me start by saying, it has been an honor working with our new Board of Commissioners this past year. Well, time is moving very quickly. I’m already ¾ of the way through my second year in office as Commissioner of District 2. We have been working diligently on the sewer system the entire time making strides to improve it. After the most recent workshop meeting and all of the questions about how much money is being spent let me say one thing, the roughly one million dollars that we are going to spend for relining this system is a drop in the bucket as to what we could be spending in the future in the event of a collapse in a line. After reviewing the videos, the lines could be subject to a collapse at any given time. The linings we are installing will prevent that as well as sealing the system from ground water intrusion. We started at the areas that are in the worst condition, would cause more problems and cost more money if they did collapse. Picture yourself coming home one day and your entire front yard as well as the road to your house is all dug up with a seven-foot-deep hole. That, my friends, is what we are trying to prevent. Think of the cost of that in multiple areas, not to mention the inconvenience that you would have to endure. We are going to stay the course because what we are doing is the right thing to do. By the time you read this, the dedication will have passed for the Redington Shores Veteran’s Park. I am proud for the town’s completion of this park. It was an honor to work on a project such as this. I would like to extend a personal thank you to all who participated to help bring it all together. In closing, I will let you know, I have decided to run for another term as your commissioner in order to complete what we have started on the sewer system. Last year Redington Shores made the list of “Tampa’s Best Beaches”. That was no surprise to those of us who live in our town and enjoy a little sand between our toes. However, maintaining our beautiful beaches is no easy task. I am sure we all appreciate the herculean job that the town staff and Pinellas County did to remove dead fish washed ashore this past summer by the red tide. But have you ever stopped to think that, red tide or not, our town staff is routinely cleaning our beaches, keeping beach access walkways clear, and emptying trash containers? You can help us keep our beaches beautiful. Please remember and remind your guests that when visiting the beach leave nothing behind but your footprints. Use one of the many trash receptacles to dispose of unwanted items, and do not leave chairs, umbrellas, or canopy frames on the beach overnight as these items interfere with sea turtle migration and inhibit our ability to rake the beach. Unfortunately, over time, storms and strong wave action removes sand from the beach. Regular beach nourishment (as occurred this past fall) is needed to replenish the sand and preserve our beaches. 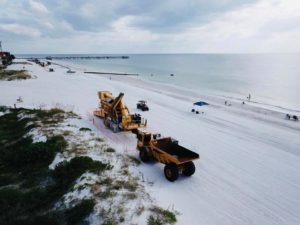 More importantly, periodic beach nourishment is necessary to provide protection against potential damage to homes and property caused by hurricanes and violent storms. Yes, nourishment projects temporarily disrupt activities on the beach, but the result is well worth the inconvenience. We encourage all beachfront property owners to grant easements that will allow future nourishment projects to move forward. Happy New Year! In District 4 we are moving forward with the one-way check valves for the storm water drains. We have found one of the outlets at the seawall needs a repair. That work is out for bid and we will move forward with the purchase and installation of the valves when the outflow side is repaired. We are in talks of speed control on 181st and 182nd Ave. W. and hopefully can come to a resolution. The Gulf Beaches Public Library has sent out for bid with three architectural and design companies to do a feasibility study for the proposed addition to the Gulf Beaches Public Library. The addition will provide a 3,000 square feet multi media room. The PSTA, even though the Government is back to work, is still going to support their federal partners with free transportation for the next 30 days. In her October 13, 2018, update, Mayor Henderson announced the Town of Redington Shores has transitioned our resident communications over to the Alert Pinellas platform through Everbridge. (You can review the mayor’s message on the town’s website.) The new system allows us to alert you to storm and emergency information by email, text, or phone call. The choice is yours, but you must sign up to the Alert Pinellas system. Residents who were accustomed to receiving information from the town through the old system should also go to the Alert Pinellas site to update their profile with cell and home phone numbers. You can access the Alert Pinellas website by clicking here. The hurricane season may be months away, but severe weather and flooding can happen at any time. Proper preparation is key to getting through any storm or disaster. Do you have a family emergency plan? Do you have a plan for your pets? Where will you go if ordered to evacuate? Have you obtained your emergency access pass? Do you have flood insurance? The Town of Redington Shores has excellent information on its website and handouts available at the Town Hall that will help you navigate through these questions and more. Visit our Prepare Ahead page. Two upcoming workshops at town hall will provide you with important flood and hurricane information. We encourage all property owners and residents to attend. Flood Insurance Awareness February 22, 2019, 6:30 p.m. to 7:30 p.m.
Hurricane Preparedness May 16, 2019, 7:00 p.m. to 8:00 p.m.
We have many property owners who join us for the winter months to escape the cold of the north. It is always good to welcome you back to your winter home. While none of you seasonal visitors are ready to think about returning north, it is not to early to think about steps you should take before leaving to protect your property in case of a storm. Below are a number of steps that seasonal visitors and all property owners should consider to protect property during severe weather. Remove all moveable furniture and objects (such as trash cans) from porch, patio, balcony and lawn. Consult/hire a property manager or reliable neighbor or friend to keep an eye on your property and address any issues that arise. Hire a lawn service or make arrangements to keep trees and lawn trimmed and to keep an eye on your property and address any issues that arise. Shut off water, appliances, gas, etc. Install plumbing check valves to prevent interior flooding. Have your roof, windows, and structure inspected. Take photos and video of interior belongings and documents. Stay informed about severe weather and emergency measures by signing up to Alert Pinellas. (Storm Smart Coasts and Southwest Florida Extreme weather Contact Information are also good sources for monitoring severe weather).